I’ve known Brad for years, and he’s also published by Blue Oranda. So far, he’s written a novella, Servant of the Muses, and its sequel, the short novel, A Pearl for Her Eyes. His main character, Jake Conrad, is a hard boiled private detective in mid-20th century San Francisco who gets mixed up with ancient gods and magical dragons. His style is best described as mythological noir. What I like about Brad’s writing: I love his characters and descriptions. I wish I could put sentences together the way Brad does. He has a great sense of atmosphere, intelligent plots and enough twists to keep you guessing. Also, I just haven’t read much mythological noir in my life. 🙂 I was taken back to Latin classes and ancient studies of my youth and somehow feeling as if Indiana Jones had gotten mixed with Harry Dresden. Where readers might have issues: One of Brad’s strengths is his incredible vocabulary and his literary references. His intelligence and background as an author shine through, but some readers may find themselves running for a thesaurus or googling poets to understand all of his references. Personally, I love that sort of thing, but you have been warned. One other thing – Brad’s books are short, which makes them perfect for a rainy evening or a night when you just don’t want to turn on the television. Servant of the Muses is a novella and A Pearl for Her Eyes is a short novel. 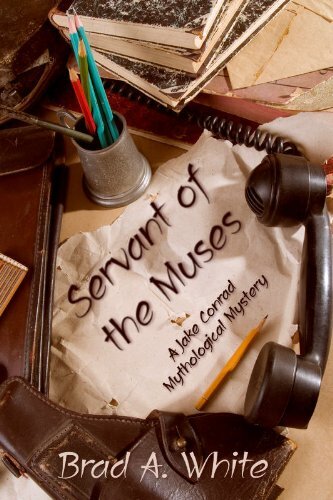 Servant of the Muses caught my attention with the introduction of the muses from the point where we learn that Clio, his assistant has gone missing. I don’t want to give anything away, but he has some great scenes as Jake tries to deal with immortals, plus a few Nazis. Twenty dollars a day doesn’t seem like quite enough to be worth facing perils that have been around since ancient Greece was young. I found it remarkable that a mix of of West Coast private detective plus mythic figures worked for me, but it did. 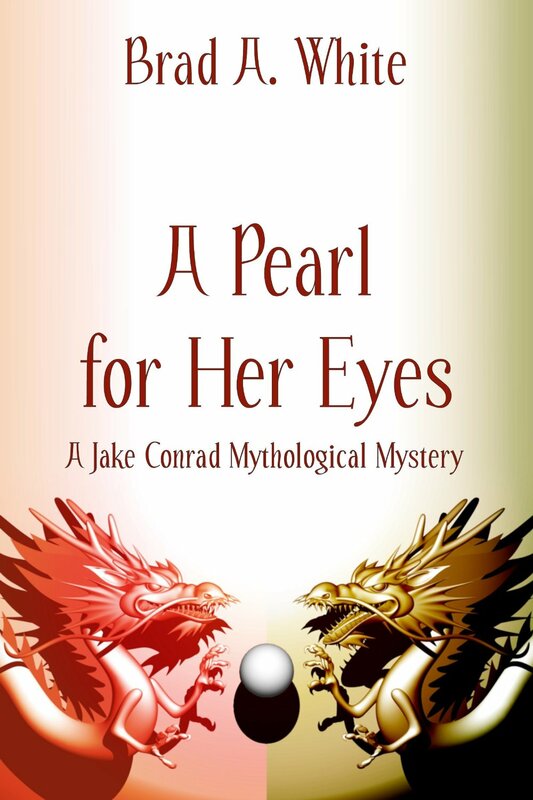 A Pearl for Her Eyes takes place after the events of Servant of the Muses and if Jake had trouble before, he finds himself trapped in a conflict between Chinese Dragons. It’s a longer tale than Jake’s first appearance, and if anything, Jake’s luck seems worse than before. I was never completely sure what would happen in this story and I’m hoping that many more books are to come. If you are looking for a new author to try, consider giving Brad White and his detective, Jake Conrad, a chance. Something as cool as mythological noir should definitely be its own genre. Posted on September 17, 2014, in New Author and tagged A Pearl for Her Eyes, Blue Oranda, Brad A White, Brad White, Chinese Dragons, Clio, Erato, Indy Author, Jake Conrad, Magic, Muses, Mythological Noir, Mythology, New Author Alert, Private Detective, San Francisco, Servant of the Muses, Urania, Writing. Bookmark the permalink. Leave a comment.